Getting nutrient-rich meals is key, but it can also be pricey. Our expert tips can help you stay on budget. By now, you've probably gotten an earful of healthy eating advice. 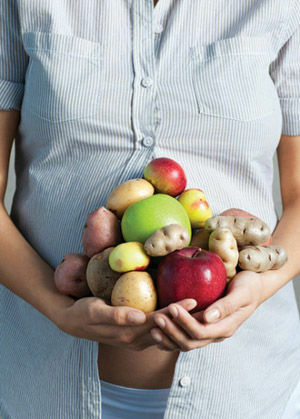 So you already know that loading your plate with fresh produce, whole grains, and lean protein is best for you and baby. The problem is that this nutritious diet can be tough on your wallet. But that doesn't mean that you have to go broke at the supermarket. With smart shopping strategies and a little preparation, eating right doesn't have to cost a cent extra, says Paola Mora, R.D., a dietitian who works in the division of Maternal Fetal Medicine at Montefiore Medical Center in the Bronx, New York. Ready to slash your grocery bill? Put the following expert tips into action. Talk about a win-win: Produce at its peak is packed with flavor, and it's also a better bargain at the checkout. "Companies pay extra to ship in out-of-season fruits and vegetables, which trickles down to their price tag," says chef Greg Silverman, the senior manager of education outreach at Share Our Strength's Cooking Matters, a national nonprofit organization. Silverman advises being flexible in the kitchen. If a recipe calls for, say, expensive out-of-season fresh green beans, swap in something that's farm fresh, such as broccoli or cauliflower. Don't want to change things up? Consider frozen or canned produce: Because they're preserved at their peak, they generally contain as many nutrients as fresh, say researchers at the University of California at Davis. When you're crunched for time, it doesn't get much easier than cooking up a chicken cutlet. But you pay for that convenience, says Mora. "If you spend a few minutes removing the skin and cutting up a whole chicken, you'll save around $6." To stretch that dollar even more, save the remnants after you're through carving. Simmer them with water, onion, garlic, and spices for a flavorful chicken stock you can use in soups and sauces. Store-brand staples, such as cereal and pasta sauce, cost about 25 percent less than the brand-name varieties. But their quality may be the same: In a blind test published in Consumer Reports magazine, people thought generic products tasted just as good as their pricier counterparts 66 percent of the time. That "50 percent off" sign doesn't necessarily guarantee that you're going to save big. To make sure that you're getting the best deal, check out the unit price—or cost per ounce—listed on the shelf, recommends Silverman. You may discover that the loose-leaf lettuce is still cheaper than that prewashed package on special. But if the sale is worth it, go ahead and stock up, adds Silverman. Buy extra non-perishable items, like brown rice or canned beans. You can also cooking and freeze produce, such as an extra batch of tomato sauce. One of the priciest items in your shopping basket is meat. That's why cooking vegetarian once in a while is a wise move for your budget, reports researchers from Oklahoma State University. Consider adding some meat-free meals into your recipe repertoire. "Excellent, inexpensive sources of protein are eggs and beans," says Mora. Quiches, frittatas, bean chilis, and cassoulets are all delicious options. Turns out you may be tossing your grocery budget away: According to the Natural Resources Defense Council, Americans throw 40 percent of their meals in the trash. That's the equivalent of $2,275 each year. How to steer clear of this waste? First off, store perishable items—like produce and meat—front and center in the fridge, so you won't forget about them. (If you know you won't use something within a few days, pop it in the freezer.) Also, think of new ways to reinvent boring leftovers: Turn vegetables and pasta into a frittata, combine brown rice and veggies into a fried rice, and pulverize last night's rolls into homemade bread crumbs. Get creative! The supermarket isn't the only place you can stock up. "Farmer's markets and produce stands often sell in-season fruits and vegetables for cheap," says Mora. If you have the room for storage, big box stores, such as Costco, offer bargains. Supermarkets also unload their overstock to discount and dollar stores, so that's another place to check out. You may be able to score steals on nonperishable items, like spices, cereals, and whole grains. All you need is a pack of seeds, some dirt, and patience to cultivate fresh veggies in your backyard, says Mora. Don't have a green thumb? Purchase some low-maintenance herb plants, like rosemary or basil, for your windowsill. "Fresh herbs add so much flavor to a dish," says Mora. "And they're packed with healthy antioxidants."